The sublime premise of an education asserts that right thinking will lead to right, if not righteous, acting. The aims of education, the teacher’s methods, the books and lessons, the traditions, and regulations of the school – all must express not just ideas, but norms, tending to make young people not only rational, but noble. From Kindergarten on, our classrooms will be saturated with Biblical truth. From Adam to Jesus, students will learn the history of God’s creation and His redemption of the world and his people. Our hope is that every one of our students will become a follower of Jesus Christ, and will be “transformed by the renewing of [their] mind” (Romans 12:2). In the early grades, students will learn the Scriptures through memorization, songs, and stories. Through the reading God’s Word and discussing its relevance to students’ lives (in addition to worship hour) we hope to instill in our students a hunger for God and his Word. Our prayer is that God would give these students a desire to know and be like Jesus. Our Science instruction is based on the Next Generation Science Standards. The materials that we use in the classroom are from Christian Schools International (CSI). With guidance from the manual entitled “And It Was Good: Teaching Science from a Christian Worldview” our teachers are able to integrate Christian worldview with the most current science standards. The primary goal of World History and Social Studies at Faith Academy is to develop in our scholars an appreciation and understanding of the Biblical principles of authority, law, impact of ideas, development of nations, consequences of national policies, and the role of history in the unfolding process of God’s plan. We study Ancient Egypt, Greece, and Rome; European History; and American History from the early explorers through the end of the USSR. We also place particular emphasis on African-American History. By reading carefully selected historical fiction novels, scholars are able to learn about different time periods. The connections made to the characters in the stories spark an understanding and enjoyment of history that can otherwise be difficult for elementary students. With an emphasis on problem solving, we use Math In Focus curriculum, previously known as Singapore Math. It’s not the content that makes the curriculum different than other methods, it’s the philosophy of what’s important and how it should be taught. Math In Focus focuses on the understanding that, without a strong foundational base, students won’t be able to have anything to draw on when it comes to increasingly complicated math learning. The method uses a three-step learning model, which consistently introduces concepts in a progression. It moves from the concrete to visual representation and then on to the more abstract (questioning and solving written equations). Students are taught not only to know “how” to complete computation, but also “why” it works. From Kindergarten on, you will find our students listening to stories, reading aloud to one another or a volunteer, or reading silently around the room. We do believe it is crucial for students to be explicitly instructed in phonics, grammar, vocabulary and other aspects of reading and writing. Throughout our entire school curriculum, our students begin mastering the writing process (pre-write, draft, revise, edit) and learning strong writing skills by recognizing traits of effective writing (ideas, organization, word choice, sentence fluency, voice, and conventions). Our goal is for all scholars to read at grade level or above. Ultimately, we want to instill a love of literature and make life-long readers of our scholars. Students have the opportunity to visit and engage with local organizations and expand learning outside the classroom. 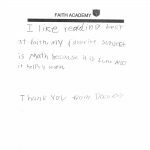 It is our desire that the students of Faith Academy receive the best individualized education program possible in a classroom setting. Therefore, the leadership has limited the classroom size to 15 students. We are a uniform school and it is expected that students are in uniform. Purity extends to the way a person dresses as well as to his or her behavior. 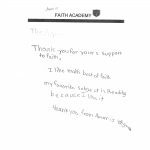 Faith Academy has adopted a guideline for dress that embraces principles of cleanliness, modesty, neatness, and appropriateness. We encourage students to wear clothing that draws attention to God, not to one’s self. Students will be expected to wear pre-approved uniforms at all times, including field trips. The goal of our school uniform is that our students will have a neat and clean appearance, showing respectfulness in their grooming.